It’s time to make a decision. Take the summer off or keep on gardening? There are many crops that can still be grown during the hot, humid days of our summer. However, if you want to take the summer off, be sure to plant some cover crops to improve the soil and keep the weeds from taking over your garden. I plan to do a little of both. Southern peas such as black-eyed peas, pink eye purple-hulled peas, and cow peas, make great cover crops. As they grow, they put nitrogen back into the soil as well as providing a tasty crop. 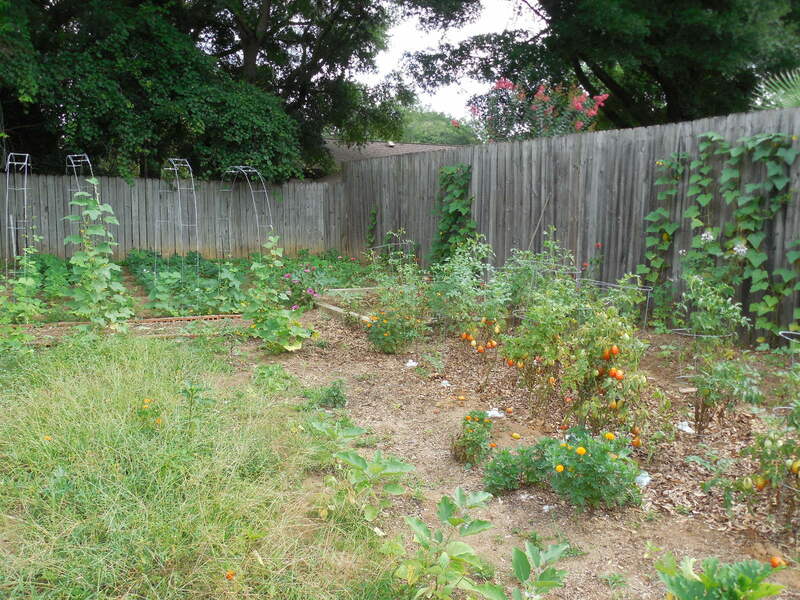 This summer, I’m growing many different varieties of southern peas, okra, eggplant, jalapenos, peppers, and basil. In the shed bed, the cherry tomatoes are actually thriving over here in the partial shade, the green beans have produced a decent crop, and as you can see the flowers are doing very well. In the large garden, the beans are producing well the tomatoes are just about done, the cucumbers are dwindling, the Southern peas are thriving, hopefully we will be able to harvest them soon. I am planting as much of the surface with Southern peas in an effort to improve the soil. I figure I can plant peas, let them grow until mid-August, till them in, let them rot for a few weeks, then plant the fall garden in September. Even though I lose a few weeks of productivity, I hope that a great fall garden will make up for it. The soil is really poor over here; it’s a wonder I actually harvest anything. 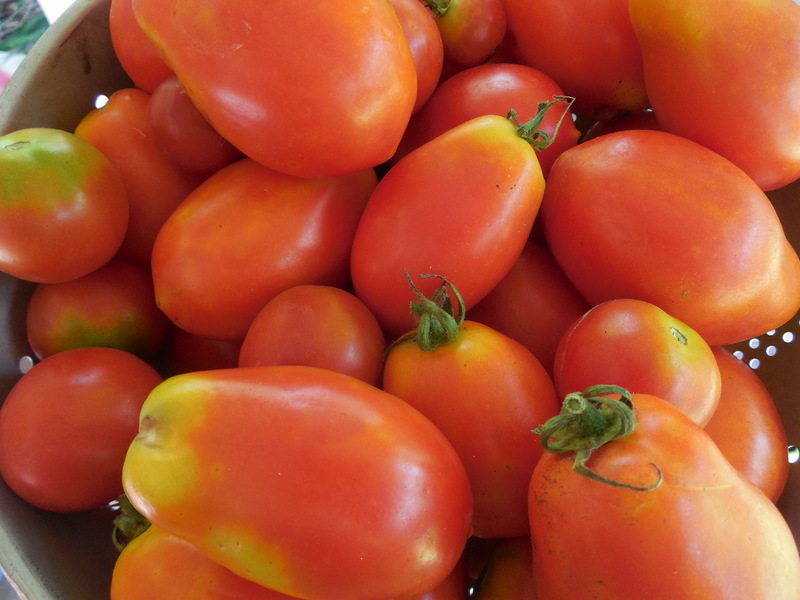 Despite the sandbox conditions, the Roma tomato plants have been the best producers this year. 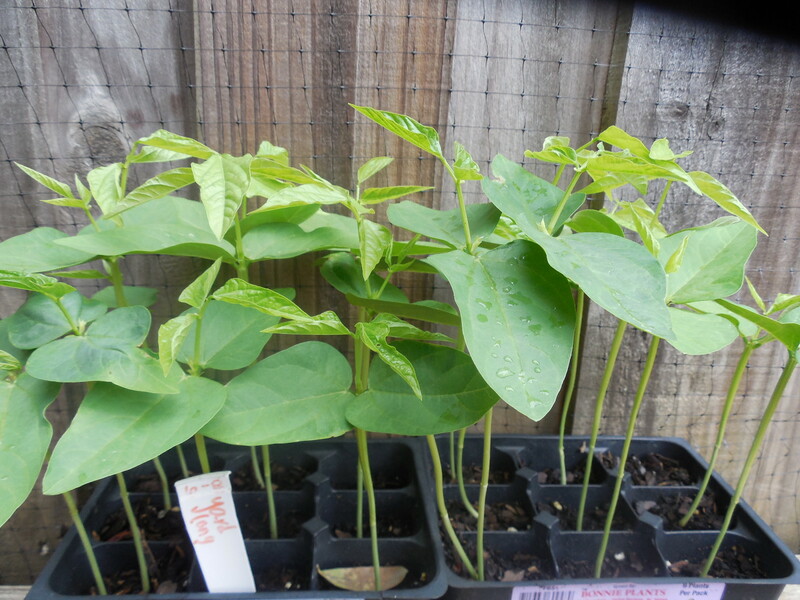 Some yard long beans are should hopefully be climbing the trellis soon. I saved a few precious seeds last year, and so planted some in flats to ensure a good stand. Ordinarily I don’t start beans in flats, but I’m not taking any chances. I did not get to taste very many of those beans last year, because I was more concerned with saving the seeds for this year, but this year I’m hoping for many meals from them. 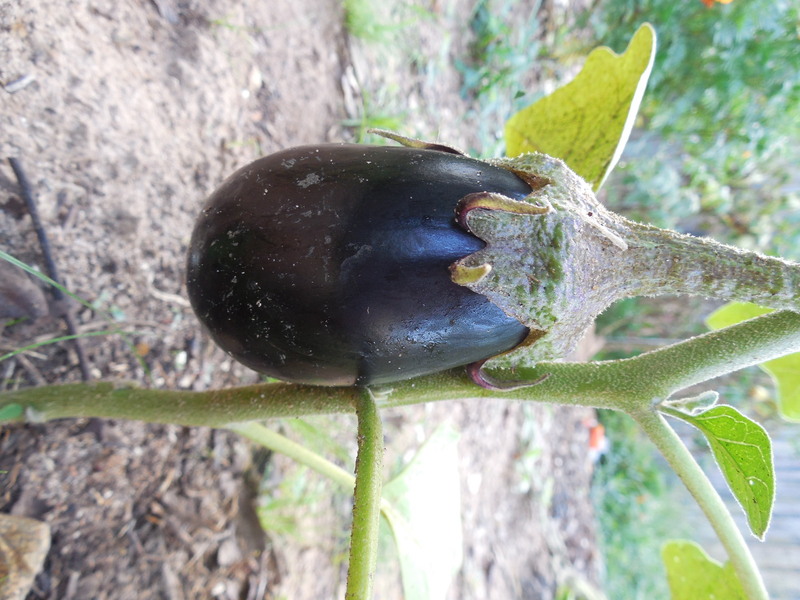 This eggplant will be ready for harvest soon. Here’s my to-do list for July. 1. 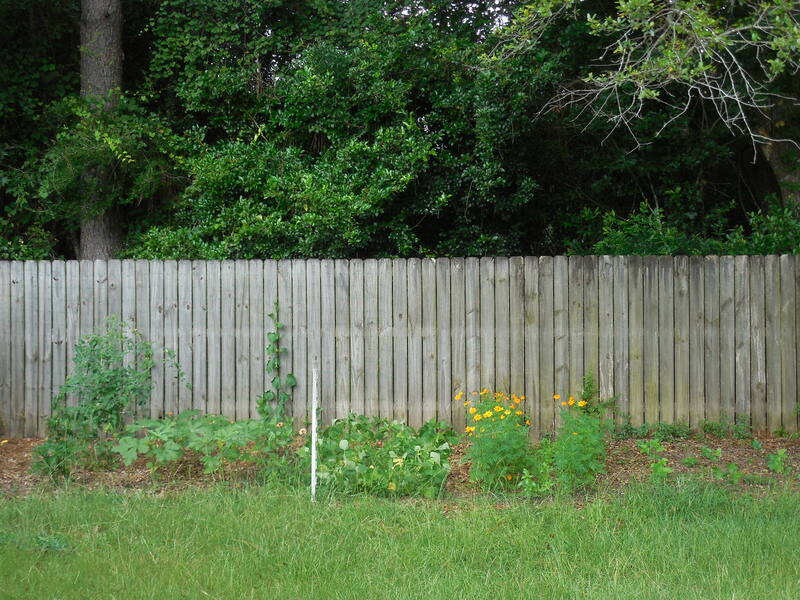 Get rid of weeds, then plant more southern peas in the bare spot. 2. Tear down the cucumbers when they’re done producing and replace with yard long beans. 3. It’s peach season, so I need to make more peach jam, peach pie filling, and maybe even some spiced peach butter. I still have some blueberries so it is a good time to mix up a batch of peach – blueberry jam-so yummy! 4. When the tomatoes are done producing(they’re almost done now), replace with Jackson Wonder lima beans. Do you have any favorite fig recipes? Yard-long beans are the best beans ever. Don’t worry- I haven’t forgotten about doing a post on them, but I had precious few pods last year and a carefully hoarded most of them for seeds.